R. Yishayhu ben Avraham Ha-Levi (about 1565, Prague - 1630, Tiberias), known under the name of “SheLaH Ha-Kadosh” (The Holy SheLaH, which is the initials of the title of his most famous book “Shnei Luchot Ha-Brit” -Two Tablets of the Covenant"), son of R. Avraham ben Shabtai Sheftel, author of “Emek Berakha” - prominent scholar, rabbi, kabbalist, a leader of his generation, one of the great framers of Jewish ethics and morality in the modern era. Still a child he moved to Poland with his father who became his first teacher. His other teachers in Poland were R. Meir ben Gedalyahu (MaHaRaM) of Lublin, one of the leading Polish halakhic authorities, R. Shlomo ben Yehudah Leib from Cracow, one of the most famous teachers in Polish yeshivot, and R. Yehoshua Falk Ha-Cohen, the author of the book "SaMa". He married Chaya, daughter of wealthy R. Avraham Maul from Vienna and apparently all his life he lived in favorable material conditions, and thus he could spend a considerable part of his income on charity and books which were very expensive in that period and affordable by just a few. He could also afford himself to invite his numerous disciples to his table. Very soon he became one of the leaders of the Jewish community of Poland, known for his expert knowledge of Torah and Talmud. In 1590 he took part in one of the meetings of the Council of Four Lands in Lublin, and his signature appears under the decree condemning the purchase of rabbinic positions. In 1597 R. Yishayahu published the book “Emek Berakha” written by his father and to which he added his own commentary under noticeable Kabbala influence. This work made the name of R. Yishayahu well known in the Jewish world, and he received offers to take high rabbinic positions in major Jewish communities. In 1600 R. Yishayahu became A.B.D. of Dubno, in 1602 - A.B.D. and Head of the yeshiva in Ostraha (Volyn), in 1606 – A.B.D. in Frankfurt-am-Main. In 1614, together with other Jews, he was expelled from Frankfurt shortly before the Jewish quarter was plundered. He then returned to his native Prague. Here he was a dayan, head of the yeshiva and shared the position of the rabbi of Prague with R. Shlomo Ephraim Luntshits (R. Shlomo ben Aharon of Leczyca, the author of "Keli Yaqar") until 1620 when his wife died. Soon after her death R. Yishayahu left for Eretz Israel. In accordance with family tradition R. Yishayahu kept his intention to go to the Holy Land in secret until the last moment. He did so for he did not wish to confuse the whole community which would try to dissuade him from leaving. Only his eldest son knew about his plans and asked him to change his mind, but in vain: R. Yishayahu was determined to go to the Land of Israel, where he hoped to achieve two goals: to strengthen the Jewish community and to study Kabbala which then played a central role in his philosophy. This is clearly discernible in his most important work, "Two Tablets of the Covenant" which he began to write in Prague shortly before his departure in 1621 and completed in 1623 in Jerusalem. The first part of R. Yishayahu's route was to Frankfurt, he evidently wished to say good-bye to the community which was so important to him. From Frankfurt he travelled to Venice, and, finally, embarked by boat from Italy. In 22 days, on the day of Rosh Ha-Shana (Jewish New Year) the boat arrived in Tripoli where heavy fighting prevented him from disembarking. A group of armed men pursued him, but he managed to escape and set sail for Syria, where he went ashore just before Yom Kippur. He was received with much warmth and honor by local Sephardi communities, which he modestly attributed to his father's notoriety, but which in fact was attributable to his own. In Damascus and Caleb (Aleppo) he looked for books on Kabbala and, quite surprisingly, he found one in the house of R. Shmuel Vital, a son of famous Damascus Rabbi Chaim Vital. This was the manuscript of the latter’s book “Ez Ha-Chaim” (“The Tree Of The Life”). Two delegations came to R. Yishayahu - from Safed and Jerusalem, both of which asked him to be the Ashkenazi rabbi of their town. Despite the kabbalistic tradition in Safed, he preferred Jerusalem – “because of the great holiness of this city”. Another reason for his decision could be that walled Jerusalem seemed to be much safer than Safed which was not surrounded by walls. In 1621 R. Yishayahu arrived in Jerusalem, after visiting Safed "in order not to hurt its community" and pray at the graves of its great kabbalists. He almost immediately became Ashkenazi A.B.D of Jerusalem and shortly thereafter remarried, evidently prompted by the kabbalistic belief of the time that an unmarried Jew had no right to live in Eretz Israel. He was also appointed the head of the Ashkenazi yeshiva, thus strengthening his leadership in the Ashkenazi community of Jerusalem. He enjoyed high esteem and respect with the city's Sefardi community as well. In 1625, together with 15 other Jewish scholars, rabbis and communal workers, he was imprisoned by the Pasha (Ibn Faruh) – a local Muslim ruler appointed by the Turkish Sultan. They were held in prison for about two and a half weeks, starving and tortured, until an exorbitant sum of money had been paid as a ransom. R. Yishayahu came back to Jerusalem and very soon discovered that after the payment of the ransom both the Ashkenazi and Sefarfi communities found themselves deep in debt, and he tried to improve the situation with help from abroad. But it was clear that to stay in Jerusalem was very dangerous, and along with the other leaders of the Ashkenazi community, he fled to Safed. He lived his remained years in Safed and Tiberias, where he died and was buried by R Yohanan ben Zaccay and his disciples who put stones on the grave which lacked a matzevah (tombstone). 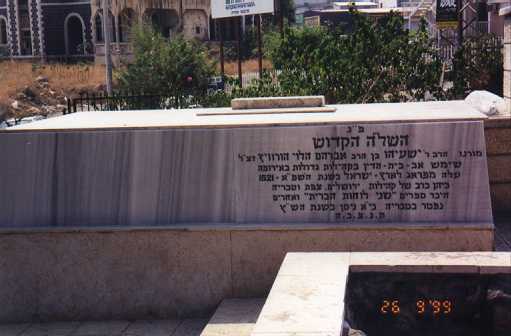 R. Yishayahu’s grave lies close to that of Ha-RaMBaM. His second wife, Chava, a daughter of R. Eleazer, and their daughter died soon after his death. From his first marriage he had two sons, R. Shabtai Sheftel and R. Yakov, and a daughter. R Yakov married Sarah, a daughter of the famous R. Eleazer, one of the prominent Cracow scholars, a son of R. Naftali Chayot, A.B.D. of Prague. R.Yakov began to publish his commentaries on his father's siddur "Shaar Ha-Shamaim", but he died before publication had been completed. In Cracow R. Yishayahu's daughter, Nechama, was married to R. Chaim Faivel, a son of famous R. David Zakharya, called "Mendelin". R. Yishayahu who descended from a well-to-do family and married into an even wealthier one, lived a comfortable life, not knowing what need or economic dependence is. In Eretz Israel, too, there was a servant in his spacious and well furnished apartment, which was allotted to him by the Ashkenazi community of Jerusalem. For his part he refused to receive a salary for his work and spent much on philanthropy, particularly to support Torah scholars. R. Yishayahu made a great contribution to the development and strengthening of Ashkenazi communities in Eretz Israel. He lent a big sum of money to the community of Jerusalem which remained in debt to his daughter even after his death. R. Yishayahu came to Eretz Israel for the purpose of dedicating himself to studying Torah and fulfilling the mitzvoth connected with life in Eretz Israel. He was happy that he had been privileged to teach his fellow Jews Torah in Eretz Israel, the Holy Land, and in Jerusalem, the Holy City, to instruct them and to guide them to love and fear the Lord, “faithfully and with all one’s heart”. He hoped and planned that thousands of Jews would come after him, and he himself would achieve great heights in Torah learning and administration of community life. He hoped for the revival of the Jerusalem Ashkenazi community under his leadership and as a result of his extensive contacts with Ashkenazi communities in the Diaspora. By reason of R. Yishayahu’s profound personal respect for eastern Sefardi communities, they influenced him greatly as a result of his encounter with their culture, customs and tradition. He was happy when he had an opportunity to pray with and provide a drasha in a sephardic congregation, “in the Holy Language, very clearly”, and he adopted some of their liturgical traditions. In Eretz Israel the works of Ha-ARI (R. Yitzhak Luria), R. Moshe Cordovero and R. Yosef Karo made a strong impression on R. Yishayahu. He called them “three great holy ones….true angels of the Almighty”. His study of the writings of these scholars reinforced the kabbalistic elements in his works. For him Kabbala was a teaching of the “sages of truth who have been initiated into the secrets of the Almighty passed in an unbreakable chain from man to man beginning with Moshe Rabenu (Moses) on Mount Sinai”. R. Yishayahu believed that the moment of revelation of the secret knowledge contained in the book "Zohar" as part of the preparations for the approaching geula (Salvation) had come: “this last generation is allowed to learn the Secret Teachings in public because they are close to geula and will make no errors”. In accordance with this, in his approach to Torah learning, the fulfillment of mitzvoth and questions of faith R. Yishayahu prefers RaMBaN’s and other kabbalists' point of view as opposed to that of RaMBaM and other rationalists. The best known of all R. Yishayahu’s writings is his pioneering work “SheLaH” – “Two Tablets of the Covenant“. The first edition was published in Amsterdam in 1649. Later this book was reissued at least 10 times. Some of these editions were made possible by his son – R. Shabtai Sheftel who added to it his preface – "Vavei Ha-Ammudim". Another important work by R. Yishayahu is his commentary to siddur "Sha’ar Ha-Shamaim" (The Gates of Heaven) which was published by his great grandson in 1717 also in Amsterdam. The title of the siddur originated from the words contained in parashat ha-shavua (weekly portion of the Torah) "Vayetzeh" about the time he arrived in Jerusalem: "How awful this place is, this is nothing but the House of G-d and this is the Gate of Heaven" (Bereshit, 28.17). His book "Shmot Gittin" deals with importance of monitoring carefully the correct spelling of names in the work done by sofrei gittin – scribes of divorce certificates. Later, besides his glosses to his father’s "Emek Brakha" (Cracow, 1597) and "Yesh Nohelin" (1617), R. Yishayahu wrote commentary to the book "Mordekhai" on the Talmudic tractate "Mo'ed", only a part of which was published in 1757 under the title "Bigdei Yesha", chiddushim to "Moed", which constituted a response to "Chiddushei Ha-RITBA" and a commentary on the calendar of Mordekhai ben Hillel, a part of which was published together with "Emek Brakha" in 1787. Also his "Letters from Eretz Israel" which contain valuable autobiographical material, the article "Mitzvot Tefillin" and commentary on the "Zohar" have come down to us. Much biographical data is contained in the work of his son, Shabtai Sheftel, "Vavei Ha-Ammudim". 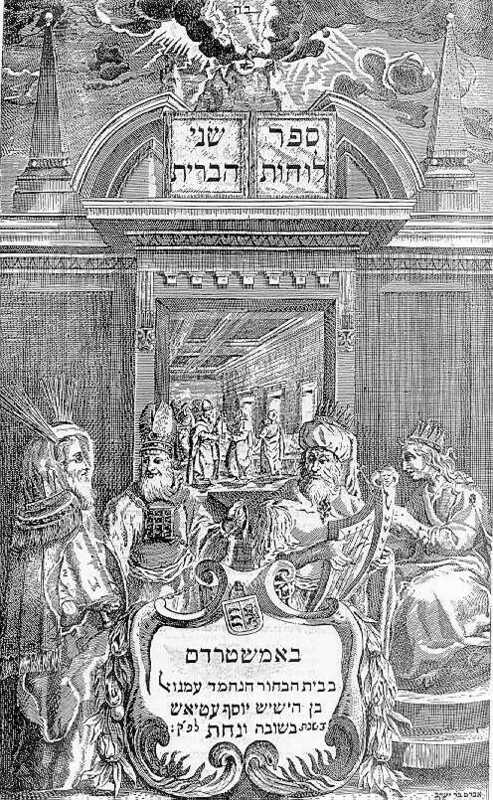 Generations of Jews in Central and Eastern Europe until the end of 18th century walked in the light of the Holy SheLaH. It is very probable that this work influenced greatly the foundations of chassidism as conceived by BeShT. Many of its tenets, such as transforming bad qualities into good ones and joy in everything one does became essential elements of the principles and way of life of that movement. Here lies THE HOLY SheLaH Our teacher Rabbi YISHAYAHU ben Rabbi AVRAHAM HA-LEVI HOROWITZ Blessed be the memory of the righteous one Who served as head of the Rabbinical Court in the great communities of Europe Came from Prague to Eretz Israel in the year 5381 - 1621 Served as rabbi in the communities of Jerusalem, Safed and Tiberias Composed the books "TWO TABLETS OF THE COVENANT" and others Passed away in Tiberias on the 21st of Nissan 5390 May his soul be bound in the bond of life.